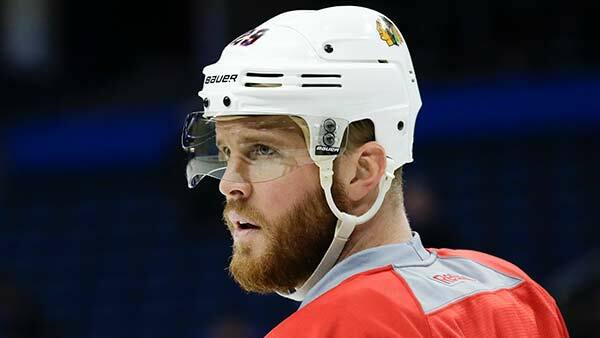 Chicago Blackhawks left wing Bryan Bickell watches during practice at the NHL hockey Stanley Cup Final, Friday, June 5, 2015, in Tampa, Fla.
CHICAGO (WLS) -- Bryan Bickell signed a one-day contract with the Chicago Blackhawks so he can officially retire from the NHL with his former team. He played 384 of his 395 NHL games with the Blackhawks and scored 65 goals and 70 assists during his 10-year NHL career. Bickell, 31, was a member of the three Stanley Cup champion teams with the Blackhawks. The 31-year-old Ontario native shared in November of 2016 that he has multiple sclerosis. He was with the Carolina Hurricanes at the time. Bickell was originally selected in the second round of the 2004 NHL Draft by the Blackhawks. He and his wife, Amanda Bickell, also run the Bryan & Amanda Bickell Foundation which seeks to create awareness and compassion for "pit bull" type dogs and work with them to help abused children.